Ready… Set…. Launch! 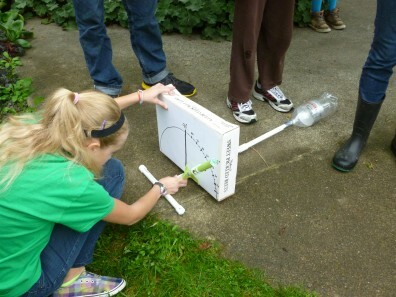 A 4-H club member measures her launch angle before testing her rocket as part of the 2014 National Youth Science Day Experiment: Rockets to the Rescue! Robotics. Aerospace. Alternative energy. Engineering. Environmental science. Agri-science. Veterinary science. These are just a few of the programs that 4-H youth participate in everyday and learn new skills that make a difference in our communities. Our hands-on programs empower youth and provide them with opportunities to grow, learn, and become confident kids. These factors result in competent, caring, connected, confident, young people of character who contribute to society. 4-H Science is based on inquiry-based learning, in which youth construct their own learning by using science skills to explore and gather evidence in an investigative manner. To learn more about this instructional method, check out the Inquiry-based Learning Fact Sheet. Resources & Kits. We have a variety of STEM kits, curriculum and materials available for to loan to teachers, 4-H clubs, afterschool programs, and other youth development organizations. STEM Training. We provide custom trainings for educators and youth workers in inquiry-based experiential education, and trainings for implementation of specific STEM activities and kits. STEM Events. Partner with us to provide programming for in-school science events, family nights or other special STEM events.